jbs inspiration: Oh Happy Day! Oh Happy Day! Tina here today! That is how I feel when I receive my monthly box from Jenni Bowlin. I’m like a kid on Christmas morning, anxious to see what goodness is awaiting for me behind the cardboard flaps. The May kits are SO full of happiness and joy, I wasn’t sure where to start. 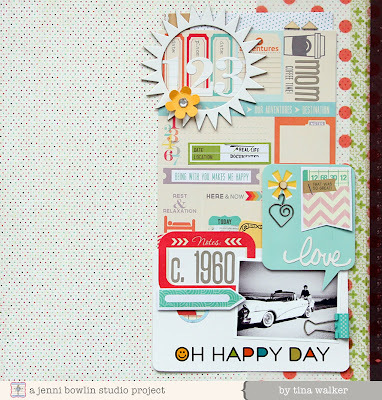 This month’s Mini Album was especially full of yummy product, so I used it as a base for my c.1960 layout. This layout is a really special one to me. This is a photo of my mom, circa 1960, in LaCrosse, Wisconsin, sitting on the hood of my dad’s car. I thought the wonderful colors and designs of the embellishments in the Mini album kit would be the perfect complement to this special photo. I especially loved the Chic Tags die cut sheet included in the Papercrafting kit, so I used it with the fun Basic Grey stickers and Studio Calico wood accent pieces. Did you notice that I used the entire die cut sheet? I couldn’t bear to cut it up and use the individual pieces, so I used the entire sheet as a fun paper accent behind my photo. Did you spy the product packaging on my layout? I never throw the fancy product packaging out. I try to incorporate it into my layouts and projects as often as I can. 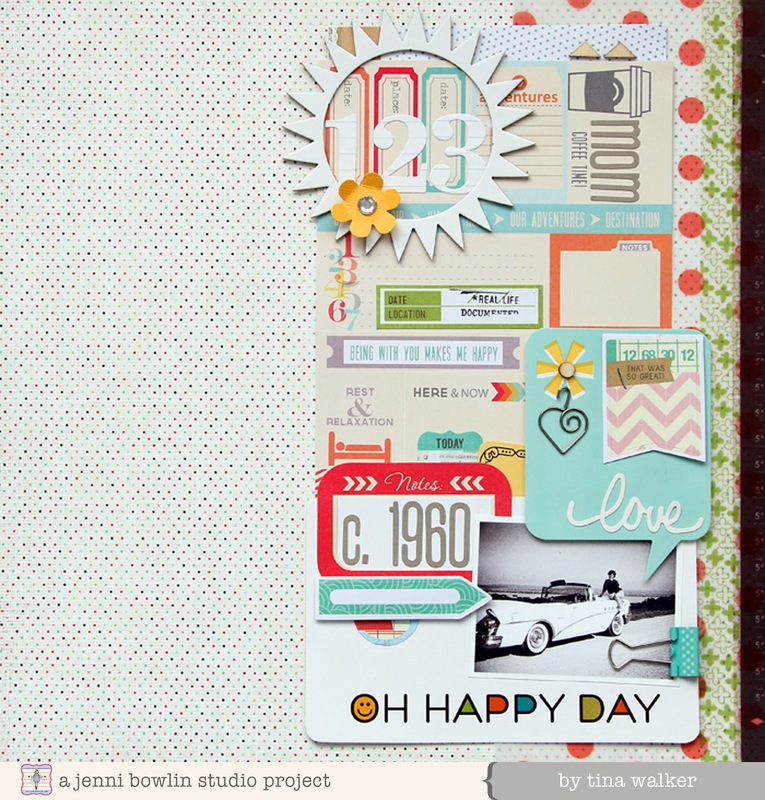 Another favorite item in the Mini Album kit is the American Crafts vellum. Vellum is a current love of mine and how fun is this red dot pattern? It added the perfect little POP of color! Be sure and stop back! More May kit projects will be shared and the inspiration is unbelievable. What an awesome layout!!! Love that you used so many embellishments on one page! !